If you talk to your desktop PC, it's probably for all the wrong reasons--usually to hurl expletives at the machine for not working properly. Well, users of the desktop version of Google Chrome now have a more productive reason to get chatty with their computers. Google has added voice search for Google Maps to Chrome, offering users a (sometimes) faster way to get directions. The main Google Maps interface in Chrome now includes a microphone icon. When you click it, a "Speak Now" dialog appears. How well does it work? Pretty well in my brief testing, albeit with a few hiccups. 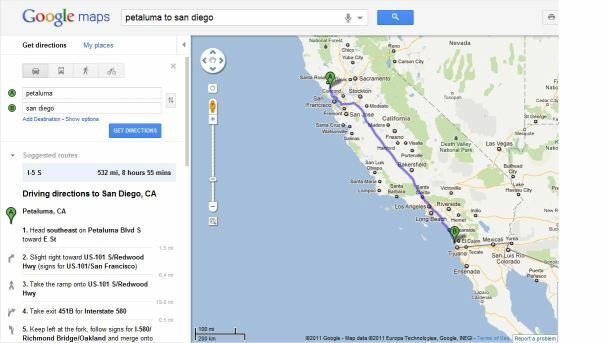 When I said, "Petaluma to San Diego," Google Maps understand me perfectly and posted the map below. And when I asked Google Maps to find my old street address in Denver, Colorado, it got it right, displaying a Street View thumbnail and a map of my previous residence. Stalkers, this one's for you. Maps isn't perfect, though. It tripped up twice on "Saskatchewan," interpreting the Canadian province's name as "Josh want" and "gotcha wanna" before getting it right the third time. Can you say a name and city, and get a correct street address? I tried using my own name. "Jeff Bertolucci, Los Angeles, California" came out as "yahoo salucci, los angeles, california." OK, so Google Maps' voice search isn't perfect--particularly for somewhat exotic-sounding places and names--but it seems fairly reliable overall. And since smartphone users already use voice input to get directions and other info, it's good to see that desktop PC users can get vocal too.